Two years ago, Zenith introduced the revolutionary Defy El Primero 21, the only high-frequency automatic chronograph designed to measure hundredths of a second, ushering watchmaking firmly into the 21st century. In 2019, the Swiss Manufacture is taking another big leap with the Defy El Primero Double Tourbillon: an innovative model powered by the El Primero 9020 calibre and its two separate escapements. One of the latter serves to keep the chronograph beating at an exceptional frequency and power the 1/100th of a second display, while the other ensures the lasting precision of the watch. This model is available in two limited editions: a 10-piece platinum version and a 50-unit carbon interpretation. With its DefyY collection, Zenith is constantly innovating and setting the standard for tomorrow's watchmaking: after the unequalled Defy El Primero 21, the first serially produced mechanical chronograph to provide hundredth of a second measurement; followed by the Defy Lab, the world's most accurate mechanical watch with an unprecedented oscillator, the Haute Horlogerie manufacturer is unveiling the Defy El Primero Double Tourbillon. This unprecedented combination of horological complications two tourbillons and a 1/100th of a second chronograph features truly exceptional qualities. For this model, Zenith has developed two tourbillons, a first for the Maison. In an additional feat, one of the tourbillons (at 10 o'clock) is coupled with and regulates the chronograph measuring and displaying hundredths of a second in a perfectly legible manner. Beating a frequency of 50 Hz (360,000 vibrations per hour) with its carriage performing a complete rotation every five seconds, this tourbillon is the fastest in the world. It drives the chronograph hand at the amazing speed of one full turn of the dial per second. The second tourbillon (at 8 o'clock), operating at 5 Hz with a carriage performing one rotation per minute, regulates the rate of the watch, meaning the hours, minutes and seconds. The case, in platinum or in black carbon, measures 46mm x 14.5mm. It has an AR-coated sapphire crystal, a sapphire display back, and it is water resistant to 100 meters. Movement is the Swiss automatic Zenith in-house caliber El Primero 9020 with 59 jewels, 36,000 vph and a power reserve of 50 hours. Exclusive two-tone signature on plates and bridges. 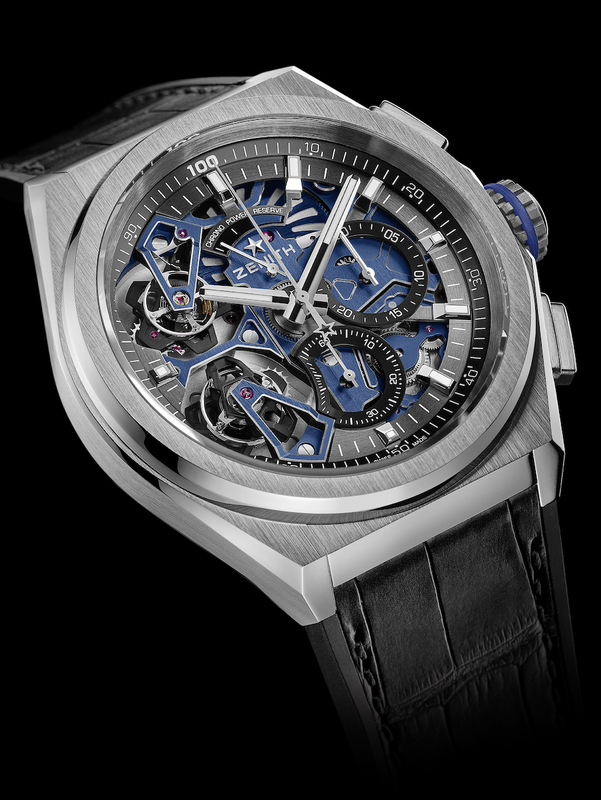 Blue-treated tourbillon carriages with the Zenith star. Special rotor with satin-brushed finishes. Chronometer-certified by Timelab. Functions are: hours and minutes in the center. Double Tourbillon: one escapement for the Watch (36,000 VpH / 5 Hz the carriage makes one full turn in 60 seconds). One escapement for the Chronograph (360,000 VpH / 50 Hz the carriage performs a complete rotation in 5 seconds). 1/100th of a second chronograph: Central chronograph hand that makes one sweep of the dial per second, 30-minute counter at 3 o'clock, 60-second counter at 6 o'clock, chronograph power-reserve indication at 12 o'clock. The two dedicated barrels one for the watch and the other for the chronograph respectively provide 60 hours of power reserve for the watch and 50 minutes for the 1/100th of a second chronograph. 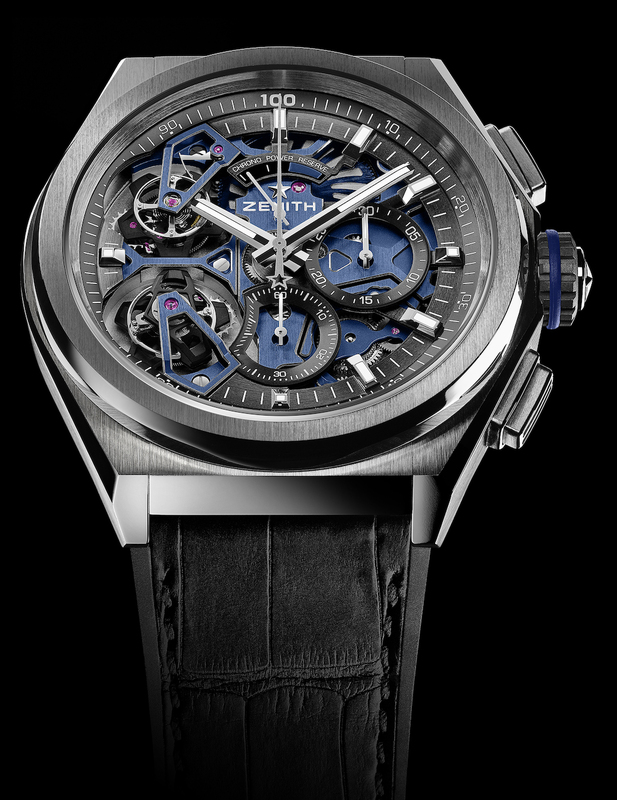 It has an openworked dial with Rhodium-plated or black Ruthenium-plated faceted hour markers with SuperLuminova. Rhodium-plated faceted gold hands or black Ruthenium-plated with SuperLuminova. It comes on a black rubber strap with black alligator leather coating, with with Cordura-patterned blue rubber, and a titanium and 18kt white gold or black carbon double folding clasp.